We have recently published the paper “Individual migration patterns of Eurasian golden plovers Pluvialis apricaria breeding in Swedish Lapland; examples of cold spell-induced winter movements”. You can find the complete article in Journal of Avian Biology, year 2015, Volume 46, Issue 6, Pages 634-642. In the breeding season of 2011 we placed geolocators on golden plovers in our study area located in Ammarnäs – Northern Sweden – and retreived few of them in the subsequent seasons. Now we have published the data of their whereabouts with interesting results. 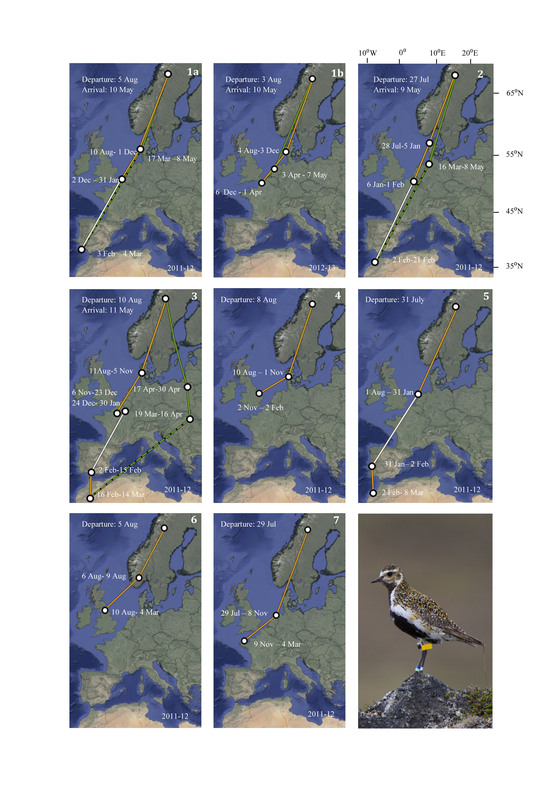 Although it was already known about the cold spell-induced winter movements on golden plovers, our study provides some first individual tracking data on this type of movements. In three cases the plovers spent the winter in NW Europe and in four cases they departed during winter from NW Europe to spend the rest of the winter in Iberia or Morocco (one bird that was tracked during two subsequent migration cycles moved to Iberia in the first winter but remained in NW Europe during the second winter). The four winter departures were associated with a cold spell in NW Europe during which maximum temperatures dropped to freezing. Cold spell-induced winter movements were notably long and fast. The birds that remained at their NW European wintering site did not experience such cold spell. However, the plovers did not always move in response to freezing temperatures, as demonstrated by the individual that was tracked for a second season, when it experienced four cold spells at its wintering site in NW France without leaving. Little information was obtained about spring migration, but one bird had a prominent counter-clockwise loop migration pattern through E Europe. Due to their cold spell winter movements, golden plovers exhibit great flexibility in migration patterns, resulting in a notably large spread in final wintering areas. Great job! Congratulations for the paper! For sure, this delicious worm is a worthy reward for that long journeys!